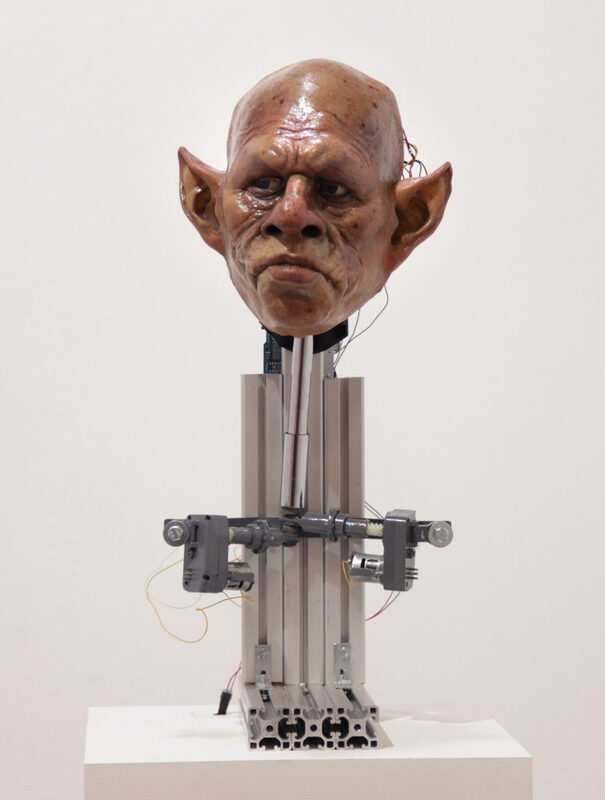 The piece “Robinson” is part of Ting-Tong Chang’s new body of work investigating the history of automatons in Europe as a means of exploring utopian visions. The word “automaton” is often used to describe self-moving machines, especially those that have been made to resemble human or animal actions. From Jacques de Vaucanson’s Digesting Duck (1739) to Andreas Jakob Graf Dietrichstein’s Mechanical Theatre (1752), automatons have entertained kings and princesses, taught moral lesson to citizens and raised deep philosophical questions. Above all, they are a technical sophistication that embodies utopian visions and political dreams. By creating automatons, Ting Tong constructs talking automatons presenting absurd dialogues, which explore socio-politically loaded issues, whilst a series of drawings chart a journey through a mythical landscape. Various characters and personalities feature, disclosing their private fates and universal fears: hooligan jaguar warriors, chav tribal wars, council huts, Western Union and NHS shaman. Ting-Tong Chang was born in Taiwan and received his MFA at Goldsmiths, University of London. He currently lives and works in London. He creates large-scale installation works that look to analyze the relationship between science, technology and society. He has exhibited and received a number of awards internationally. Recent solo shows include theEdinburgh Sculpture Workshop (2014), the Manchester Centre for Chinese Contemporary Art (2015), the Christine Park gallery London (2016) and the Asia House London (2016). Group exhibitions include the 6th Taipei Biennial (Taipei Fine Arts Museum, 2008), the Forum Biennial (Taipei Contemporary Art Center, 2010) and the European Performance Art Festival (Warsaw Centre for Contemporary Art, 2011). Chang received the Edinburgh Creative Initiative Award 2013, the RBS Bursary Award 2015 and the RISE Award 2016 at the Art Central Hong Kong.